Mwanza — AGA Khan Hospital is set to establish e-Health and Mobile Health programmes in partnership with the Ministry of Health and Social Welfare as innovations to facilitate health communication. The Project Administrator, Agapati Sanday, told the 'Daily News' in Mwanza City that the initiative was meant to improve health services. "Apart from communication, there will be e-leaning service as well as the processing and transmission of information between selected primary medical centres of Mwanza and Dodoma regions," Sanday said. He added that e-Health will support delivery of maternal, newborn and child health (MNCH) care through connectivity and linkages in health facilities. Sanday noted that more specifically e-Health will facilitate capacity building of health workers and improve diagnosis and treatment at primary health facilities. He said, for example, the programme's network infrastructure aim to connect two primary medical centres to the Aga Khan Hospital in Dar as Salaam and local government facilities will use e-health, telegraphic medical, e-learning and health informatics. Using tele-health, the synchronous live video conferencing will be used for tele-consultations between primary medical centres and Aga Khan Hospital in Dar es Salaam. This system will be used by doctors at primary medical centres to consult specialists at Aga Khan Hospital, Dar es Salaam and government facilities on radiology or dermatology images. He said that for e-learning, continuing professional development opportunities will be provided for health workers who would otherwise not have access to such training away from their locations. And health informatics would be implemented for primary medical centres and linkages with government health management information service and this will facilitate sharing of reliable health information to aid health managers and clinicians in making better decisions. ARUSHA, Tanzania, May 11 – The Aga Khan University (AKU) has expanded its network even further following the launch of a new health facility in Arusha, Tanzania. The modern health centre located on Seth Benjamin Street, within the central business district, was launched on Friday to offer high quality health care services. These include physician consultations, a wide range of diagnostic services including a CT scanner, ultra sound, a modern laboratory and pharmacy. The Centre was established last year in June 2012 as a first step to AKU’s major presence in Arusha. “This is a much needed service and a bench mark for high quality health care in the region,” Stanslaus Mageso Mulongo, the Regional Commissioner in Arusha said at the launch. He further noted that AKU is planning to establish a hospital in its principal campus site that will provide quality service for specialised and critical care at internationals standards. “The hospital will be a welcome facility that will enable the residents of Arusha and beyond access world class care, a much needed service in the region,” he said. 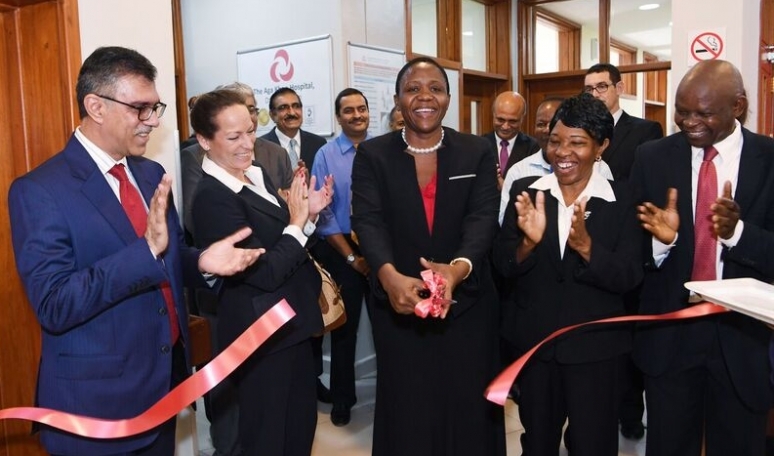 The launch also attended by senior government officials, diplomats, members of the East African secretariat, corporates, donors, prominent citizens and members of staff was presided over by Firoz Rasul, President of AKU. The Regional Commissioner commended His Highness the Aga Khan, Chancellor of the Aga Khan University for his immense contribution to the development of education, healthcare, culture, infrastructure development, economic growth, and tourism not only in Arusha but in Tanzania, East Africa and beyond. He applauded the University’s future plans to establish a principle campus in Arusha, boosting the city’s vision of being the regional hub for East Africa. He also noted that the substantial investment by Aga Khan University in Arusha will create new jobs, economic activity and educational opportunities and the Government is open to new investment to help develop the Arusha Region. Rasul further said that the Arusha campus will be a new community with a vibrant educational center that will nurture the region’s future leadership. The project will involve the development of academic and research facilities; student residences and amenities; a library; student centre and auditorium; sports facilities; a new hospital, a school as well as housing and amenities for faculty and staff. The campus will house the Faculty of Arts and Sciences that will offer undergraduate and graduate studies in a merit-based and interdisciplinary educational programme tailored to the opportunities and challenges of contemporary East Africa. Graduate professional schools in Law; Media and Communications; Tourism and Leisure; Management; Government and Public Policy; Architecture & Human Settlement; and Economic Growth and Development will also be established. Currently the Aga Khan University is working with the Regional and District Commissioners on a Regional Plan to improve the infrastructure of the Arusha Region, including roads, water management, community facilities, and public amenities. AKU is also cooperating with Nelson Mandela African Institute of Science and Technology to develop the Arusha region as a higher education hub for East Africa. Emphasising on AKU’s long term commitment in the region, Rasul said that the University plans to invest over USD 1 billion towards establishing its campuses throughout the region adding more than 10,000 new jobs to the current 2000 already working for the Aga Khan University in East Africa. Coastweek -- The Aga Khan Hospital, Mombasa has received Halal Certification for its Hospital Catering services from the Kenya Bureau of Halal Certification (KBHC). Halal certification is given to products, which have undergone inspection by the Kenya Bureau of Halal Certification (KBHC) and have been found to conform to the acceptable standards and other laws that govern food handling and production/ processing. In addition to this, the Hospital is pursuing HACCP certification. Hazard Analysis and critical control point (HACCP) is a systematic approach to identifying and controlling hazards (i.e. microbiological, chemical or physical) that could pose a threat to the preparation of safe food. Our Hospital is dedicated to providing quality patient care with special attention to access, affordability, clinical excellence, patient safety for the communities we serve, with leadership in diagnostic services and selected areas of program specialization. Dr. Chiguzo knows first-hand the impact a microscope can make in detecting anomalies through analysis of specimens which lead to more accurate diagnosis and treatment of diseases. Throughout his years in rural and community health, Dr. Chiguzo has been on the frontline of healthcare initiatives in under-resourced areas, where the smallest things can make a big difference. Now, as a member of the Executive Committee of Kwale County responsible for Medical and Public Health Services, he shares his knowledge and insights to contribute to more improvements in healthcare. During the ceremony, Dr. Chiguzo handed over a new microscope - donated by an anonymous well-wisher - to the Deputy Chairperson of the Mwanda Dispensary Health Committee Mrs. Fatuma Karumbi. Mwanda dispensary, which is managed by Nurse Incharge Ms. Joyce Kinamah, is one of the 20 dispensaries that serve as a ‘first level contact health facility’; this and other dispensaries have been supported by the Aga Khan University’s Department of Community Health based in Mombasa, Kenya. Coastweek -- Microscope handed over by Dr. Athuman Chiguzo [second left] to the Deputy Chairperson of the Mwanda Dispensary Health Committee Mrs. Fatuma Karumbi and Mwanda Medical Lab Technician Kombo Mwarimo [left]. In this vein, the Medical Laboratory Technician of Mwanda Dispensary was provided with three days of intensive orientation and skills training on the effective use of the microscope at the laboratory of Aga Khan Hospital, Mombasa. The primary goal in supporting these health facilities is to establish and sustain Community Units, which are served by trained community health workers (CHWs). More specifically, the CHWs are trained to deliver community-based health care for the benefit of improving access and quality of health services for pregnant mothers and children less than 5 years of age. This project - popularly known as Mama Na Mtoto (MNM) - was sponsored by the European Union and co-funded by Aga Khan Foundation/UK; it is now completing its second phase by the end of December 2015. Speaking on the occasion, Dr. Amyn Lakhani, Director of the Department of Community Health, thanked the government health officials including Dr. Mwaleso Kishindo, Chief of Health, Kwale County and Dr. Judith Gitau, Sub-County Medical Officer, Kinango, for supporting MNM project for the last 7 years in Kwale County. Dr. Lakhani also thanked members of the dispensary committee and local CHWs whose daily efforts made the MNM project a success. In closing, Dr. Lakhani mentioned the start of a new health systems development project for the sub-county of Kaloleni to begin in 2016. The project, which is sponsored by the Canadian Department of Foreign Affairs, Trade and Development and the Aga Khan Foundation, Canada, will be implemented by the Aga Khan Health Service, Aga Khan University, and the Aga Khan Foundation. Coastweek-- The 11th annual Breast Cancer Awareness and Screening camp was held at the Aga Khan Hospital Mombasa (AKHM) on 23rd and 24th of October. A multidisciplinary team of pathologists, surgeons, radiologists and nurses from Aga Khan University Hospital Nairobi (AKUHN) joined the local medical team at AKHM with volunteers from the Breast Cancer Awareness Support Group (BCASG) of AKHM. A total of 797 participants were screened during the camp and 78 Ultrasounds,70 Fine Needle Aspirates, 25 diagnostic mammograms and 12 core biopsies were performed free of charge. A total of 240 women over the age of 40 years have been referred for screening mammograms being offered at discounted rates at AKH-Mombasa. In addition, an online Knowledge Attitude and Practice (KAP) survey on breast cancer was administered to all consented women. The survey tool was developed by the Aga Khan Health Board –USA team and the Aga Khan Development Network e-Health Resource Centre for South-Central Asia and East Africa and will enable assessment of the level of breast cancer awareness among women within the community. Mhh! President Uhuru’s life started being filmed when he was only a few days old. Remember this was in 1960s when the only good cameras in Kenya were own by KBC or is it VoK. So Sonko was having a sleepless night and he decided to pass time on social media. The Nairobi Senator was rummaging through his archives when he came across an interesting footage. And he was quick to upload it on his timeline. The video was about Kenya’s first and fourth Presidents. The latter was way young to imagine he would lead Kenya some 52 years to come. The video was filmed when Jomo Kenyatta was visiting his 2-day-old son who was born at Aga Khan Hospital in Nairobi. Perhaps it’s the first public glimpse of one Uhuru Muigai Kenyatta. The video has since gone viral on social media. THE Aga Khan Medical Centre Mwanza will start conducting free breast cancer screening to residents in the region and neighbouring ones starting January next year. This will be a continuation of the similar campaign going on in Dar es Salaam once every month. It will be performed in Mwanza every last Saturday of each month. The centre’s Manager, Ms Waheeda Khatry, told reporters here yesterday that the screening will start for breast cancer before extending to other conditions like cervical cancer later. “Our Institution has decided to extend this service to residents in Mwanza Region and will be sustainable. We, therefore, call on all women to take full advantage of this opportunity and check their health status,” she appealed. Already, according to her, six doctors and three nurses have been trained on how to carry out the exercise and that all the preparations towards the mission were in top gear. Over 1,000 women attended the free breast cancer screening camp conducted at the centre over the weekend, which was attended by a team of experts from the Aga Khan Hospital in Dar es Salaam and Aga Khan University Hospital in Nairobi, Kenya. Speaking on the exercise and the magnitude of the breast cancer and other forms of cancers in the country, leader of the team and Oncologist, Dr Amyn Alidina, said the three-day camp dealt with mouth cancer, breast cancer and prostate cancer. “At the end of the camp, we expect to attend up to 1,000 cervical cancer screenings, 130 prostate cancers screenings and at least 30 mouth cancer screenings,” he told reporters. Dr Alidina noted that Mwanza and the entire Lake Zone had many patients for breast cancer, which calls for more investment and interventions to deal with the problem. He challenged the government to seriously invest in cancer vaccinations, citing countries like Rwanda, South Africa and Mozambique that he said have gone very far in cervical cancer vaccination. Giving his comment on the matter, the Mwanza Regional Acting Medical Officer, Dr James Kengia, said at least three screening centres for breast cancer screening have been established in the region. He said already three cryotherapy machines have been fixed in Magu District Hospital, Sekou Toure Regional Hospital, Mwanza and Kwimba District Hospital for breast cancer screening. “We are trying hard to circulate public education campaigns on Non Communicable Diseases among the residents and specialised center for cancer screening will soon be established at Bugando Medical Centre,” said Dr Kengia. On the introduction of cancer vaccines in the country, the Acting RMO said Tanzania has already kicked off efforts by embarking on the vaccination pilot programme going on in Kilimanjaro Region. By Saumu Mwalimu for The Citizen. Dar es Salaam, January 10, 2016 — At least 35 women and children will undergo free reconstructive surgery during a three-day clinical camp at the Aga Khan Hospital (AKH) in Dar es Salaam starting from today. The surgery, which usually costs about Sh150,000 to Sh2 million in major public hospitals, including Muhimbili National Hospital (MNH), targets ordinary Tanzanians. Briefing reporters at the camp yesterday, AKH regional chief executive officer Sulaiman Shahabuddin said the surgery would involve people with various disabilities caused by fire accidents, who failed to afford reconstructive surgery when they were treated. The Aga Khan Hospital, Mombasa has organized a free screening event to join the global awareness to be held this Saturday 12th March, 2016 next to the Rehabilitation Centre from 8.00am to 4.00pm by their certified Nephrologists, Nurses and individuals who want to make a difference. The state-of-the-art renal unit has been specially designed and professionally staffed to meet the unique needs of those with chronic kidney disease. The equipment ensures quality care in line with Joint Commission International Accreditation (JCIA) Standards in a spacious, quiet and comfortable environment for patient’s safety. The renal unit serves patients with chronic kidney disease who require hemodialysis for the rest of their lives or until they would require a renal transplant. World Kidney Day is an education event, held on the second Thursday in March every year. Uganda is sending 400 cancer patients to Kenya for radiation treatment after its only radiation machine broke down beyond repair. Kenya has only three public radiation machines available at Kenyatta National Hospital, and there is also a backlog of thousands of people waiting for treatment. However, Uganda’s Health Minister said the country’s patients are unlikely to compete with Kenyans at KNH but they will go to the Aga Khan Hospital in Nairobi. “Government will as soon as immediately transport 400 cancer patients to Aga Khan hospital for treatment. Government will transport and offer other necessities to all those that will be referred to Aga Khan hospital,” the minister of state for Health, Dr Chris Baryomunsi, told an afternoon parliamentary session. Uganda is likely to spend about Sh100 million at Aga Khan. The average cost of one radiotherapy session in Nairobi’s private hospitals is Sh10,000 and many patients require up to 25 sessions. In a city where public-private partnerships in healthcare haven't been successful 11 of 13 such hospitals built on BMC lands and meant to reserve free beds have been found not adhering to the rules a set of three hospitals are showing the way to compassion. Over the last seven years, the collaboration between Mazgaon's Prince Aly Khan Hospital, Sion’s Lokmanya Tikal General Hospital and Mumbai Central’s BYL Nair Hospital has led to treatment for 350 patients suffering from cancer in the Head and Neck (H&N) region. They have treated 800 others. This accreditation means that the Aga Khan Hospital has achieved a level of quality and patient service that is equal to the best hospitals in the world. “JCI is the global gold standard of hospital accreditation,” top officials affirm. Speaking during the ceremony held in the city lately, the Chief Medical Officer, Professor Muhammad Kambi said “On behalf of the Government, I would like to congratulate this hospital. It is a wonderful achievement. Professor Kambi also expressed his appreciation for the offer made by the Aga Khan Hospital to work with the Government on improving safety and quality standards across all of Tanzania’s hospitals. The CEO of the Aga Khan Hospital in Dar es Salaam, Dr Sulaiman Shahabuddin, reiterated the Aga Khan Development Network (AKDN)’s commitment to improving health care in Tanzania. Dr Shahabuddin also mentioned that as a result of this partnership, two Government of Tanzania health facilities had recently received ISO 9001: 2008 certification. “Not every hospital achieves JCI accreditation,” Dr. Walraven continued. “Over the last two years, we have introduced methods and systems that raise the quality of patient care to the level required by JCI. JCI accredits hospitals and academic medical centers. It also accredits clinics, laboratories, ambulance services and emergency transport organizations, home care, long term care and primary care facilities. According to JCI, “each hospital and health care organization that applies for JCI accreditation takes about two years to prepare. During this time, the entire organization works together to develop and implement the new high quality and patient-safe policies, practices and procedures that are required to meet our standards. “During JCI’s on-site evaluation, a team of expert JCI physicians, nurses and health care administrators visits the organization and evaluates more than a thousand measurable elements. Coastweek-- The Aga Khan Hospital Mombasa through their Breast Cancer Awareness Support Group organized an awareness walk that was flagged off by Mr. Mohamed Hersi, CEO Heritage Hotels and Chairman, Kenya Coast Tourist Association. October being the international month of Breast Cancer awareness, the hospital has planned a number of activities which includes a Bowling Night on 19th October at Nyali Cinemax Bowling Alley and a Free Breast Cancer Camp which this year will also include cervical screening. This year the Free Breast Camp shall be held on 21st and 22nd October at the Aga Khan Hospital Mombasa and shall include cervical screening in partnership with Faraja Cancer Trust. AGA Khan Health Services in the country expects to construct 35 health service centres countrywide by December 2018 to support the government’s efforts to deliver quality services. The Health Services’ Regional Chief Executive Officer, Mr Sulaiman Shahabuddin, said in Dar es Salaam over the weekend that upon completion, the project will create jobs for 525 Tanzanians as well as encourage students to study science subjects owing to expansive health sector in the country. Mr Shahabuddin, speaking at the launch of Aga Khan Health Service Centre at Tabata Segerea in Dar es Salaam, said the agency intends to deliver health services to the public through construction of modern health clinics to provide basic medical care at affordable cost to people of all status in the society. “The services available at our health centre range from radiation like X-Ray and Ultrasound to laboratories, human medicine, clinics for children and clinics for family health,” he explained, adding that currently there are only eight operational health service centres in the country. NEARLY 80 women and children who suffer from various skin deformations as a result of fire burns and violence have undergone a free of- charge surgery at the Aga Khan Hospital (AKH) this year. Surgeons from the AKH and Muhimbili National Hospital (MNH) in collaboration with the WomenforWomen organisation from the US jointly worked to treat the poor patients, who could not afford to pay for such services. The cost for a minor operation stands between 1m/- and 1.5m/- whereas a major single operation can be charged 2.5m/. According to the WomenforWomen team leader, Prof Andrea Pusic, the exercise was conducted in January and December this year. In January, at least 35 patients benefited from the free services and in this month 37 victims were also operated on, where 17 were children and 20 women. October 2016: The Ocean Road Cancer Institute (ORCI) in collaboration with Kunduchi Beach Hotel, Aga Khan Hospital and other Stake holders had organized PINK WALK on 29th October, 2016. The event was held at Ocean Road Cancer Institute from 6.45 in the morning. Around forty (40) of our volunteers which includes Ismaili Volunteer Corps, Guides & Scouts, and Crisis Resource Team and other Ismaili Ladies, were allocated duties such as parking, crowd control, ushering, registration, water stalls, High Table and VIP guests to be escorted and looking after the high table. Under the agreement, Kisumu Aga Khan Hospital will over the next five years expand to a 90-bed facility from the current 61 beds. French Ambassador to Kenya Antoine Sivan hailed the partnership. The Aga Khan Health Services-Kenya and Agence Française de Développement (AFD) on Friday signed a Sh1.25 billion expansion and upgrading agreement for Kisumu and Mombasa Aga Khan hospitals. At a colourful signing ceremony attended by Mombasa Governor Hassan Joho at the Aga Khan Hospital in Mombasa, the hospital’s Chief Executive Noorali Mimon said the agreement includes developing a cardiology programme and a day-care chemotherapy centre. Mr Momin said the expansion programme would strengthen existing services, expand diagnostics and upgrade the quality of services and facility to international standards. “These programmes will fit seamlessly within the Aga Khan Development Network continuum of care approach with links to Aga Khan Hospital-Nairobi. "Additionally, AKDN will expand its footprint by establishing additional 10 Outreach Health Centres to the current three centres,” he said. Moyez Alibhai, the chairman of the Aga Khan Health Services-Kenya described the move as a milestone towards providing better healthcare for Kenyans. “This is a major milestone. We also want to thank our French partners. From this partnership, thousands of people have [benefited] and will benefit from modern healthcare,” said Mr Alibhai. He said the Aga Khan hospitals in Kenya, Tanzania and more than 30 countries worldwide had received global awards for providing modern, unique healthcare services. Under the agreement, Kisumu Aga Khan Hospital will over the next five years expand to a 90-bed facility from the current 61 beds, implement elements in cardiology and cancer programmes, expand and establish an additional 10 Outreach Health Centres. The French Ambassador to Kenya Antoine Sivan hailed the partnership and promised that his government would continue to partner with The Aga Khan Health Services. Governor Joho, who was the chief guest at the ceremony, praised the Aga Khan Hospital in Mombasa saying it had cooperated with the county during accidents such as one that took place at Mazeras last December. “Doctors were already on strike, but the Aga Khan Hospital stepped in to treat our people who were involved in the Mazeras accident,” he said. He said the development of modern equipment would save residents the trouble of travelling abroad for treatment. Nairobi, Kenya, 12 January 2017 - As part of one of the largest expansions of quality health care services in East Africa, the Aga Khan Development Network and the Agence Française de Développement (AFD) today signed agreements for a total of US$19.5 million towards the improvement and expansion of the Aga Khan Hospitals in both Kisumu and Mombasa. The total project cost is $27.8 million (over Kenyan Shilling 2.8 billion). The balance investment of $8.3 million is a grant from the Aga Khan Development Network. In Kisumu, the Aga Khan Hospital, will grow to a 100-bed facility (from the current 61 beds), expand its women and child health programme, implement elements of cardiology and cancer programmes that are part of the regional AKDN continuum of care approach and create a niche programme in infectious diseases with linkages to non-communicable diseases. In addition, the Hospital will expand its footprint by establishing an additional ten Outreach Health Centres. The Aga Khan Hospital, Mombasa major expansion, will include the establishment of an invasive cardiology programme, a day care chemotherapy centre, a neonatal high dependency unit and a niche in rehabilitation medicine. Additionally, the Aga Khan Hospital Mombasa will expand its reach in the Coast Region by establishing an additional ten Outreach Health Centres during the planned period. The Aga Khan Hospital Outreach Health Centres serve as “hubs” for the AKDN’s expanding East Africa Integrated Health System in the region, which is dedicated to providing high-quality health coverage at affordable prices to an economically diverse population. The Agreement was signed by the AFD Regional Director, Mr Bruno Deprince and Chairman of the Board of Directors of the Aga Khan Health Service, Kenya, Mr Moyez Alibhai. JANUARY 11, BOSTON, MA—Pathfinder International is pleased to announce the award of two new grants from the Bill & Melinda Gates Foundation that have the potential to change how donors and implementers approach contraceptive access programs. The two projects, totaling nearly $10 million, will advance access to a full range of contraception, especially for adolescents and youth, through adaptive and innovative approaches. In developing countries, more than half of all women of reproductive age want to avoid pregnancy, yet 225 million women are not using an effective method of contraception. Of the estimated 38 million sexually active adolescents in these regions, 23 million have an unmet need for modern contraception. Pathfinder will partner with Camber Collective, YLabs, and The Center for Effective Global Action’s Behavioral Economics in Reproductive Health Initiative and build on ongoing Pathfinder projects in Tanzania, Burkina Faso, and Pakistan to implement an innovative four-phase approach to gather insights, generate and test solutions, and support adaptation and scale up. In Pakistan and Tanzania, we will also engage with local partners, Aga Khan Health Services in Tanzania and Greenstar in Pakistan, for solution development and testing in the private sector. It has been a week and a half since my last blog post and what an eventful week and a half it has been! We left Dar es Salaam to go on Safari and next we moved onto a small city called Iringa which is about an 8.5 hour drive west from Dar es Salaam. I must admit that it was nice to get away from the busy atmosphere of the big city and get a break from the intense and unforgiving heat for a few days. Iringa has a certain unique charm that made me feel welcomed in the city wherever I went including the local restaurants, markets, and health care centers. Being able to see the view of the beautiful mountains reminded me of home while the cultural music from the churches and the public meetings of people in the street was a new but comforting experience. Overall, my impression of Iringa is positive and this was best exemplified by the nursing teaching sessions at the Aga Khan Medical Center. As Kenyans continue to grapple with health crisis owing to doctors strike, more than 200 people suffering from lifestyle diseases benefitted from a free medical camp in Mombasa county. The free heart screening medical camp that was organized by the Aga Khan University Hospital and the Aga Khan Hospital in Mombasa on Friday saw majority of patients battling diabetes and High blood pressure getting treatment and medication. Other patients suffering from other ailments also turned up at the camp and were treated at subsidized price. Vice President Samia Suluhu Hassan told a Franco-Tanzanian Business Forum here yesterday that macro-economic reforms had created a good investment environment. According to her, the government’s priority is to increase investments in agro-processing. the French Development Agency has offered a soft loan of $53.3 million for constructing 30 health centres and expanding the Aga Khan Hospital. The Aga Khan Institution of Health Service Tanzania yesterday launched a new dispensary at Mbagala Zakhiem in Temeke municipality in Dar es Salaam region in a move to improve provision of quality health care services to the community. Speaking during the launching event, Aga Khan Health Service, East Africa, Regional Chief Executive Officer, Sulaiman Shahabuddin said their goal is to invest in the health sector at various areas in a bid to support the government in improving the health service sector in Tanzania and build a nation of healthy people. At the same occasion, the Acting District Medical Officer (DMO) in Temeke, Martha Macha, said the government will cooperate with the institution to make sure the health service in the country is improving. She insisted on the institution to use their dispensaries in providing quality health services to the community according to the guidelines of the Ministry of Health, Community Development, Gender, Elderly and Children. "Through these dispensaries I hope you will provide quality health services that are friendly to the people, according to the guidelines of the relevant ministry. Thank you for supporting the government because you are doing the right thing at the right time," she said. According to her, Temeke municipality has a large population of people compared to the number of health centres existing. She said the launched dispensary will help the residents of Mbagala to get quality health services at affordable cost to people of all levels. The Aga Khan University Hospital (AKUH) has opened its first outreach clinic on Thika Road in Nairobi as it seeks to grow its business following increased demand along the superhighway. The hospital, which has about 49 outpatient clinics in Kenya and a few others in Tanzania and Uganda, opened its latest facility at a new building next to Mountain Mall, Ruaraka. Aga Khan’s venture to Thika Road sees it join hospitals such as Mater Hospital, Avenue Healthcare and Gertrudes Children Hospital which have operations either in the popular Thika Road Mall or Garden City. Private hospitals in the country have in recent years stepped up the opening of satellite clinics, radically changing the face of healthcare services by taking facilities closer to patients. Nairobi Hospital, for instance, is set to spend up to Sh600 million in opening up to six new satellite outpatient clinics over the next one-and-a-half years at strategic locations across the country. The first of these clinics would be opened next month at the upcoming Kiambu Mall, targeting residents of the bustling town and neighbouring estates such as the upmarket Runda Estate. The disclosure was made here recently by East African Community Secretary General, Ambassador Liberat Mfumukeko while meeting the Aga Khan Diplomatic Representative in Kenya, Dr Azim Lakhani. He said their expansion programme will cost the three branches more than 40m USD in total, adding that the Aga Khan work in Dar es Salaam has already started. The meeting was a followup of the Secretary General's visit to His Highness the Aga Khan on 11th November 2016, where the two met to discuss the possibility of expanding the Aga Khan Integrated Health Systems across all the EAC Partner States, especially in secondary cities of Kisumu, Mombasa, Arusha, Mwanza, Entebbe, Jinja, Butare and Ngozi, among others. During the meeting, Ambassador Mfumukeko had also requested His Highness the Aga Khan to support their staff to build their capacity through scholarship programmes and also in different projects. In another development, Dr Lakhani requested for Investment Promotion Service (IPS) programme in the areas of Agro-processing to be also supported by the Aga Khan, and informed the Secretary General that currently, AKDN has an Export Agro-processing industry where it empowers rural areas. He said already the programme is being implemented in Kenya where about 7,000 farmers are being involved in Premier Food Inc (food processing), rigoken (vegetable processing) and All fruit (fruits processing), among others. The Secretary General urged AKDN to ensure similar programmes are replicated in Tanzania and other EAC Partner States, where they also agreed to visit the AKDN Food Processing Plant in Ruiru and Murang'a in Kenya and implement their findings also in other partner states. The East African Community and Aga Khan Development Network have a Memorandum of Understanding (MoU) that was signed in 2012 specifying for poverty reduction, employment creation and income generation programmes as major cooperation areas. They were to be implemented in the selected regions of the EAC Partner States through stronger regional and local markets by investing in infrastructure, social and educational enterprises, media and communications, financial services, among others. Paris, France, 19 April 2017 - The Aga Khan Health Services (AKHS), an agency of the Aga Khan Development Network (AKDN) and Expertise France today signed an agreement to enhance the quality of palliative care services in the Aga Khan Hospitals in both Kenya and Tanzania. The programme is being grant funded by the Agence Francaise de Developpement under which AKHS will receive 250,000 € to conduct specialised training for 4 doctors and 4 nurses – also known as “champions” through the Institut Curie. The Euros 250,000 grant will go towards the implementation of a pilot palliative care training project for professionals from four hospitals of the Aga Khan Health Services in Kenya (Nairobi, Kisumu and Mombasa) and Tanzania (Dar Es Salaam). The programme will be implemented by Institut Curie, world renowned for their technical expertise in palliative and supportive care and their pragmatic, tailor-made trainings. Expertise France has been instrumental in working with the Aga Khan Health Services and Institut Curie to develop the overall implementation plan. According to Dr Alexis Burnod, the project’s key expert and responsible for implementing Institut Curie’s training activities, « The spread of palliative care culture as a criterion of healthcare excellence towards patients and their families is a universal invitation. It is the result of the work of an entire team dedicated to promote a comprehensive care focused on the patient. This partnership programme with our Kenyan and Tanzanian counterparts reinforces this international humanist dynamic”. “Our 15 years of experience creating partnerships and exchanges between hospitals in the North and the South have shown the value of giving healthcare professionals the opportunity to learn from one another – improving not only skills, but also the organisation and the continuum of care” added Mr Sebastien Mosneron Dupin, CEO of expertise France. The partnership will bring Kenya and Tanzania closer to their goal of establishing palliative care services in the region by providing specialised clinical training as well as by enabling hospital professionals to establish designated palliative care units. Experts from Institut Curie and Expertise France will provide continual support and feedback throughout the process, resulting in invaluable information for advocacy, policy changes and scaling-up of the programme. The quality of life of patients and their families facing life-limiting illness is a growing concern in low-income countries, particularly in Africa. Low income countries are disproportionately burdened with chronic diseases such as cancer, HIV-AIDS, kidney, heart and respiratory disease and face particular challenges in providing palliative care. According to WHO and the World Palliative Care Alliance, a staggering 78% of the 19.2 million adults requiring palliative care are estimated to be in middle- and low-income countries. Often, health facilities in these countries lack pain medication, adequate hospital facilities, specially-trained medical staff, designated palliative care units and government or policy support. In particular, opioid pain-relief is very limited, and often prohibited from importation in a large number of African and Central/South Asian countries: an estimated 80% of the world’s population currently lacks access to opioids for pain relief at the end of one’s life. The enhancement of palliative care in middle and low-income countries is a key priority for the Aga Khan Development Network (AKDN), working mainly in Africa, Asia and the Middle East. Expertise France has also responded to the burden of chronic and non-transmissible diseases in its strategy for improving health in middle- and low-income countries. The Institut Curie is a leading French institution for cancer care and research and has developed an innovative, multidisciplinary and comprehensive approach to palliative care. The Aga Khan Health Services (AKHS) is one of three agencies of the Aga Khan Development Network (AKDN) that support activities in health. The others are the Aga Khan Foundation (AKF) and the Aga Khan University (AKU). Together, the three agencies provide quality health care to five million people annually and work closely on planning, training and resource development. AKHS also works with the Aga Khan Education Services (AKES) and the Aga Khan Agency for Habitat (AKAH) on the integration of health issues into specific projects. The AKDN health system has been operating in East Africa for over 80 years. Its expanding East Africa Integrated Health System is dedicated to providing high-quality health coverage at affordable prices to an economically diverse population. Expertise France is the French public agency for international technical assistance. It aims at contributing to sustainable development based on solidarity and inclusiveness, mainly through enhancing the quality of public policies within the partner countries. Expertise France designs and implements cooperation projects addressing skills transfers between professionals. The agency also develops integrated offers, assembling public and private expertise in order to respond to the partner countries' needs. A leading player in the fight against cancer, Institut Curie brings together an internationally-renowned research centre and an advanced hospital group that provides care for all types of cancer – including the rarest forms. Founded in 1909 by Nobel laureate Marie Curie, Institut Curie comprises three sites (Paris, Saint-Cloud and Orsay), where more than 3,300 members of staff are dedicated to achieving three objectives: hospital care; scientific research; and the sharing of knowledge and the preserving of legacy. As a private charitable foundation since 1921 that is recognised as serving the public interest, Institut Curie is supported by donations and grants. This support is used to fund discoveries that will improve treatment and the quality of life of cancer patients. George E. Marsh, Jr., principal of Payette, a Boston design firm, will discuss his firm's international design work. IN a bid to improve health services in the country, Aga-Khan Hospital partnered with Aly-Khan Hospital from India, whereas the two hospitals specialists will exchange experience and know-how on health services. In addition, the partnership will cut down costs used to be paid for overseas medical treatment, most of them in India. Speaking during a news conference in Dar es Salaam yesterday, Aga-Khan hospital Chief Operating officer, Sisawo Konteh said the move aims at improving health services offered by the institution in the country. “We are in major infrastructure expansion and development; hence application of new technology is crucial in speeding service delivery. Most of Tanzanians had to travel to India for medical treatment and operations including total joint replacement, but they will not have to do so as we will have experts and technology to carry out such operations in the country,” he stressed. Expounding further, he said funds that will be saved by the government in taking patients abroad for such treatments will be used for other development projects, which will improve lives of people. According to him, the partnership will not only benefit the hospital but also other public and private hospitals with existence of new knee and hip replacement operation technology. Speaking in the same event, Mumbai based Aly Khan hospital Chief Executive Officer, Sanjay Oak said the partnership is another evidence of true friendship the two countries have in improving lives of its people. He noted that, health care is expensive, but with services being undertaken in the country will help more people. “Health care in many countries are expensive and if we will join hands together and exchange experience we are in good position to reduce costs of medical treatments, and improve health of the people,” he noted. Dr Oak said they will be in the country for almost 5 days, exchanging experience with Tanzanian counterparts, adding they will also conduct total knee and hip replacement operations, among others. Additional and expanded facilities within the hospital are being established as part of the Phase 2 Expansion of the hospital alongside the on-going construction of the new 14,000 sq. metre wing. The total cost of the expansion is approximately US$ 80 million, which includes a Tzs 120 billion (US$53.5million) loan facility from the French Development Agency Agence Francaise de Developpement (AFD) and a Tzs 60 billion (US$ 26.3 million) grant from the Aga Khan Development Network.